The Rag Blog: David Hamilton : In France, Socialists Rule! Supporters of French Socialist Party react after the announcement of the results of the first round of the French parliamentary elections. Photo by Fred Dufour / AFP / Getty Images. Internationally, the main significance of the Socialist victory is that it changed the terms of the debate about the EU debt crisis. The Socialist Party of France is on a roll. It has reached a historic pinnacle of unprecedented strength. In May, their candidate, Francois Hollande, won the presidency against the right-wing incumbent, the first victory by a leftist in recent European presidential elections and the first presidential victory by a Socialist in France since Francois Mitterrand in 1988. Last year, the Socialists achieved a majority in the traditionally conservative French Senate for the first time ever. They also dominate a majority of the 27 French regional councils. And now they have won a resounding victory in the National Assembly as well. The Socialist Party now dominates French politics at every level without compromising coalition partners. Past Socialist-led governments have always been part of coalitions that included either a strong Communist Party or center-right elements. Now they rule alone and they have also largely overcome their own internal divisions. They stand united and independent, able to put their program in place without serious interference. Their victory in the 577-seat National Assembly was particularly sweet for the Socialists. In the last Parliament, they were heavily outnumbered by Nicolas Sarkozy’s center-right UMP (Union pour un Mouvement Populaire), 317-204. In the election just concluded those totals virtually reversed. In the new National Assembly, the Socialists and two small affiliated parties will have nearly 320 seats and the UMP will have 218. Roughly 20% of the seats changed hands and the Socialists won a large majority of those. The Socialist victory was largely expected, but press reports have failed to adequately emphasize its sweeping nature. A shift in party composition on this scale in the U.S. Congress is inconceivable. U.S. congressional districts have been designed so that they are almost all safe-Democrat or safe-Republican. Only 20-30 seats in the U.S. Congress are regularly competitive. That a change on this scale was possible demonstrates the more dynamic nature of French democracy compared with the stagnant and highly corrupted remnant extant in the U.S.
Like the French presidential election, the legislative elections are conducted in two rounds, but the runoffs are conducted differently. It is relatively easy for parties to run candidates in the first round. There were over 6,000 candidates running for those 577 seats. Any candidate that received more than 12.5% of the vote in the first round got to run in the second round. This often means three or more candidates make the runoff. The one with the most votes wins the second round. There has been a long-standing agreement between the Socialist Party and the UMP to keep the National Front (FN) out of the National Assembly. This was originally based on the overt anti-Semitism of the FN’s founder and leader, Jean-Marie Le Pen. Growing out of its World War II occupation experience including the loss of one-third of their Jewish population, anti-Semitism is illegal in France. So in cases where the Socialists and UMP were in a three-way runoff with a candidate from the FN, the one with less support would drop out, effectively denying the FN the possibility of a plurality victory. Although the FN regularly gets 14-18% in presidential elections, they have been shut out of the National Assembly by this means since the mid-1980’s. This time, the FN won two seats in localities where the UMP candidates dropped out in favor of the FN in defiance of their party’s long- standing dictum. However, the FN leader and presidential candidate, Marine Le Pen, Jean-Marie’s more presentable daughter, winner of almost 19% of the national vote in the first round of the presidential election in late April, lost her race for a National Assembly seat to a Socialist in what was considered a relative FN stronghold. This division on the right between the UMP and the FN is hard for Americans to understand. In the recent presidential election, the UMP’s Sarkozy and the FN’s Le Pen sounded much alike in their anti-immigrant stands. The original issue of anti-Semitism dividing the French right has diminished as Marine Le Pen has slipped into the racist closet by softening her father’s rhetoric and the UMP under Sarkozy has rivaled the FN in anti-immigrant rhetoric. The division on the right is now sustained on issues Americans know little about, particularly membership in the EU, where the FN is ardently nationalist and opposes France’s participation. The FN wants to dump the euro and go back to the franc, opposing any EU imposition on French sovereignty. In contrast, the UMP strongly supports the EU and the euro. There were election deals on the left too. The Socialists agreed to not run in certain constituencies in order to allow the Green Party to run unobstructed against the right. In return, they expect to have Green Party support on many issues. As a result of this agreement, the Green Party representation in the National Assembly went from 4 seats to 17, although the Green presidential candidate only received 2.3% of the vote in April. Where they agree, which comprises a large spectrum of issues, Green support bumps the Socialist majority well above 330. In addition, there are the 10 seats held by Left-Unity. Add them up and the combined Left will have roughly 60% of the seats in the French National Assembly. Diversity made strong gains. 37% of the winning Socialist candidates were women, leading to a record 155 women holding seats in the Assembly, up from 107 in the last Assembly elected in 2007. Nine members of “ethnic minority” groups were also elected, up from one, still a significant under-representation. Joining the ranks of Socialist lawmakers are Razzy Hammadi, born of an Algerian father and a Tunisian mother and former president of the Socialists’ youth movement, as well as Malek Boutih, of Algerian origin and former director of the SOS Racisme rights group. There were some very notable defeats in the National Assembly election. The 2007 Socialist Party candidate for president, Segolene Royal, was defeated by a “dissident” Socialist. The victor was a dissident because he was an established local Socialist leader in a district where the national party tried to “parachute” a favored candidate, Royal, into a safe seat. The locals rallied round him by 63%. The leader of Left-Unity, Jean-Luc Melenchon tried to run in the same district as FN leader Marine Le Pen. They both lost to the Socialist candidate, he in the first round, she in the second. Centrist presidential candidate Francois Bayrou lost a seat he had held since 1988, again to a Socialist. What does this Socialist dominance mean? 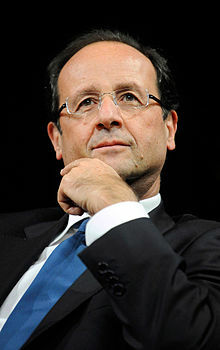 Primarily, it means there is very little obstacle to the enactment of Hollande’s “60 pledges." These revolve around reviving the economy with government spending, higher taxes on the wealthy, and the growth of public employment. The tax measures include higher marginal tax rates at the top, financial transaction taxes, ending tax havens for the rich, taxing investment income at the same rate as wages, and capping executive compensation. It also includes setting up a publicly controlled credit rating agency and making banks separate their retail banking from their investment banking, a law in line with the now defunct Glass-Steagall Act in the U.S.
Other measures on the Socialist agenda include approval of gay marriage and adoption, recognition of the Palestinian state, reduction of French reliance on nuclear energy, and bringing home all French troops in Afghanistan two years early. Given the Socialist hegemony, it is hard to see how Hollande can escape enacting all of these measures expeditiously. Internationally, the main significance of the Socialist victory is that it changed the terms of the debate about the EU debt crisis. Prior to Hollande’s election, austerity was the unrivaled approach of EU leaders in confronting the debt crisis. In the wake of the Socialist victory in France, aided by support from Obama and the growth of the Greek Left, stimulus has reentered the discussion. This is analogous to the change OWS made by introducing inequality into the U.S. political discussion. Signals seen so far concerning the direction of the Socialist government are inconclusive. On the one hand, Hollande named 17 women to his 34-member cabinet, but with few exceptions they don’t lead the most important ministries. Overall, the cabinet is labeled as moderate within the Socialist Party spectrum. An encouraging signal was Hollande’s insistence at the G-8 summit on pulling French troops out of Afghanistan this year. On the other hand, he has joined the chorus for greater intervention in Syria, albeit preferably somebody else’s. To his credit, he presented the argument for growth to the “austerians” and has changed the nature of the debate, but so far it’s largely just talk. 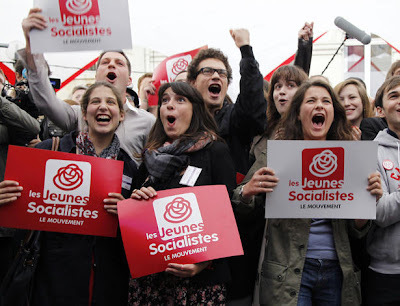 Most important, the French Socialists have a unique opportunity to reestablish the socialist brand in Europe. They doubtless hope to do as well as their Latin American counterparts in Argentina and Brazil. If France is able to create a successful new development model under Socialist leadership, Merkel, Cameron and other right wing EU leaders will face reinvigorated challenges from their left as a result.